Workers in the store during the break-in happened appeared shaken, said it was "scary." Cody O'Keefe said it sounded like a huge bang — like a shelf falling over, "but it just kept going." 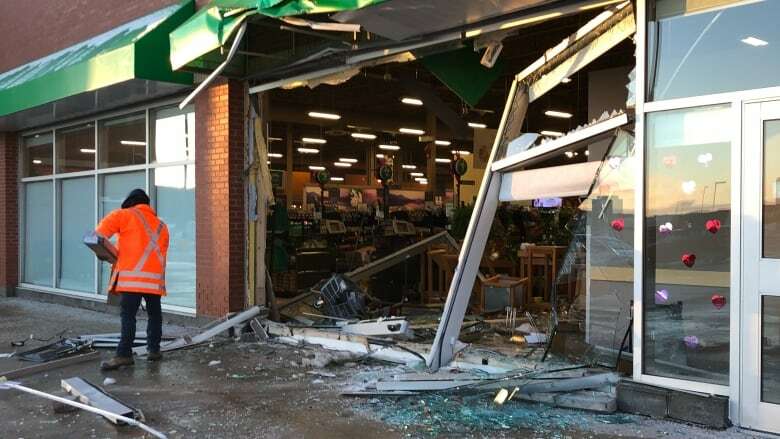 O'Keefe works overnights at Sobeys on Kelsey Drive in St. John's and was in the store when, just after 5:30 a.m., a piece of heavy equipment that looked like a backhoe smashed its way through four windows and into the supermarket's plant section. O'Keefe said he saw three people operating the machine when he went to see what was happening. Several store employees said the suspects made away with an ATM. O'Keefe said he was scared and, as he talked about it outside the main entrance to the store, he appeared shaken. As he spoke, an older man came outside and ushered him back into the warmth of the store. Shards of broken glass lined the gaping hole left behind in the store, and glass crunched underfoot on the sidewalk and into the parking lot in front of the windows. The inside of the store — aisles, knocked-over shelves and even the twisted wreck of an overturned shopping cart — was completely exposed. Shortly after 8 a.m., a worker arrived to start picking up the larger pieces of broken metal, plastic and wood, tossing them to the side. The Royal Newfoundland Constabulary said officers who responded to the scene found heavy equipment which was still running on a nearby street. 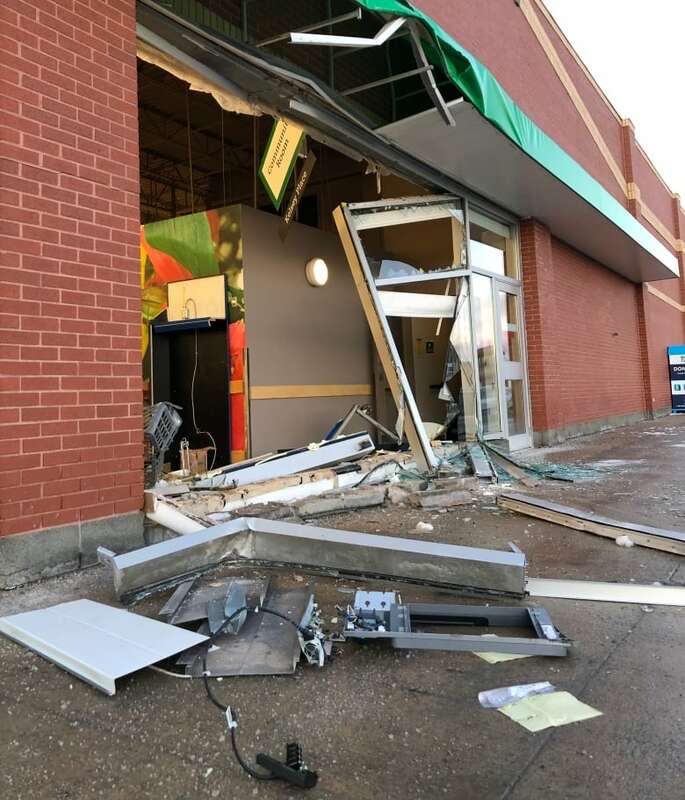 Witnesses say three men fled the scene after using the machinery to break in to the business, according to a media release issued by the RNC. The RNC also confirmed to CBC News a discarded ATM was located in Paradise in the area of Camrose Drive earlier Monday. Police say they can't confirm at this time if it's the same machine stolen earlier from Sobeys. 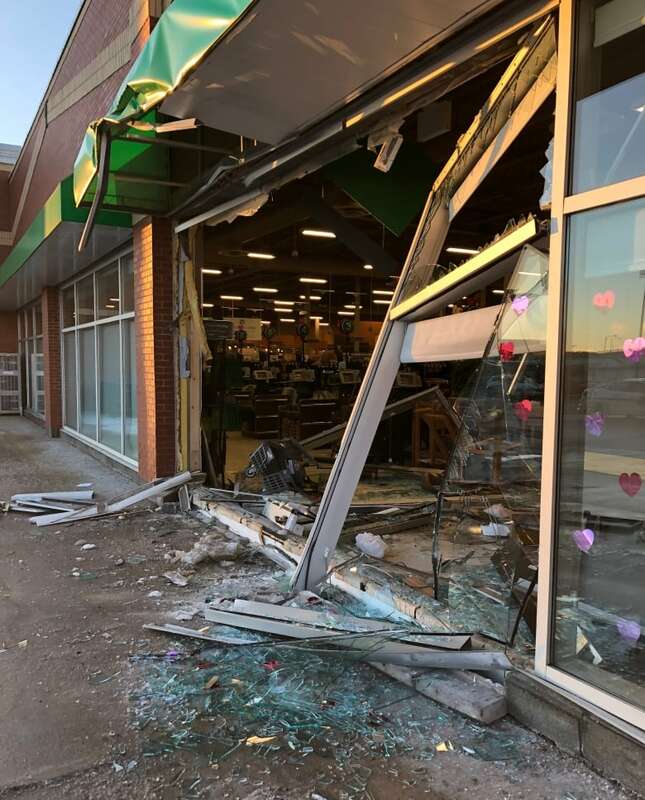 The Sobeys break-in was the second such incident in as many days. 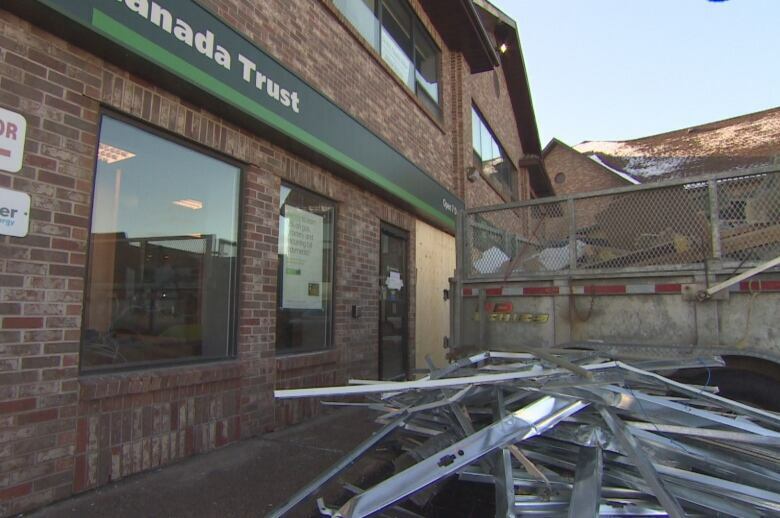 On Sunday morning at 5:20, police were called to TD Bank on Elizabeth Avenue after a front-end loader was used to smash through one of its walls. The suspects had fled the scene when police arrived, according to a release sent Monday morning. Once again, officers who responded said they located heavy equipment which was still running on a nearby parking lot, according to a RNC media release Monday afternoon. Police could not say whether the suspects got away with any money. That investigation is ongoing, according to the release. Anyone who saw anything related to either incident, or who has surveillance video, is asked to call police.